SPRUCE CREEK, FL - The annual Spruce Creek Fly-In Community Bonfire Event was held last night at "The Tree" in Windsock Park. This year's chilly weather was no match to the warmth provided by the giant pyre and the friendly multitude in attendance . Volunteers served fried chicken homemade baked beans, potato chips, beer, wine and soda, available free courtesy of Community Relations Committee of the Spruce Creek Property Owners Association. In addition, there were several tables with desserts ranging from homemade cookies to brownies and cakes. There was also a smaller bonfire where the children's roasted marshmallows. 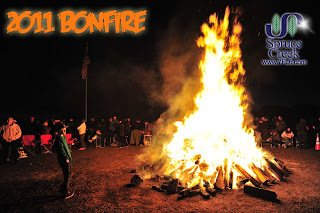 As in previous years, the bonfire was kicked off by a formation exhibition by members of the Spruce Creek Gaggle Flight Team which made several passes with trailing smoke for the enjoyment of the spectators. This year the Gaggle featured a double "missing man" formation in honor of the late Bob and Sarah Bean, both residents of the fly-in who perished recently in a crash of their plane while flying over Tennessee. The Gaggle Flight Team is composed of residents of the Spruce Creek Fly-in which graciously donate their time and aircraft to complement many area events.